Our new Jubilee Personalised Paper Cups are simply stunning promotional cups that are suitable for cold beverages and will gain some exposure of your Company brand name at the same time. Good as a momento and with a good quality print on the outer layer of the cup, you can rest assured your customers are gaining plenty of retention and awareness of your Corporate branding. Hand these Jubilee Personalised Paper Cups out to celebrate Queen Elizabeth II's 60 year reign, and you won't be disappointed with the increased business you can achieve! 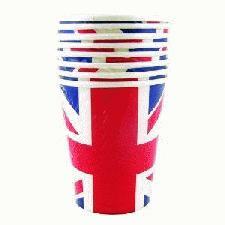 For a FREE QUOTE, please fill in the form regarding our Jubilee Personalised Paper Cups and we'll be able to help you.